What is there to say other than rave about how absolutely beautiful this book was? I cannot believe this book sat on my shelf unread for so long. I send a big thank you to Taylor for recommending it to me and threatening to end our friendship if I didn’t put it on the top of my tbr pile. Where to really start with this review? Everything in these pages is relatable. There are so many battles each of the characters are going through on their own and when they are all revealed, the reader suddenly understands that character so much more. 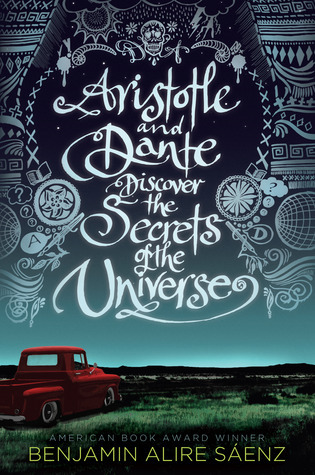 Dante and Aristotle are two halves of a whole. They just fit together. And this story works so well because they work so wonderfully together. I wouldn’t change a single thing about them and I love their flaws. It makes them human. And we like reading about things we can relate to. I was absolutely floored by the way it ended. It was perfect and I sobbed and that’s exactly how I want to feel when a book ends. I’m so glad that I FINALLY read this book and understand what all the hype was about. It was a perfect read. 150%, absolutely. Please read this book. Hi there! Thanks for your comment, though unfortunately I can’t really answer that question. I refrain from giving any spoilers about the books on my blog. If you’d like to find out a bit more about it, I definitely recommend reading it. There are plenty of surprises throughout this book and a ton of challenges and internal battles all of the characters go through. It’s definitely a book that needs to be read for your question to be answered. Thank you again! Ahhhh! Hahaha. Now I’m dying to read the book.